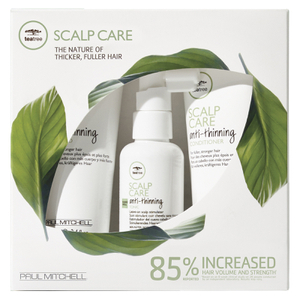 Promote thick and healthy locks with the Paul Mitchell Tea Tree Scalp Care Anti-Thinning ScalpCare Take Home Kit; a three piece collection that needs the needs of thinning hair. The set boasts an effective shampoo, nourishing conditioner and a leave-on tonic, which form a regular hair routine that increases both the strength and volume of tresses. Expect enviable locks that are full-bodied and full of life. Shampoo: 100ml / Conditioner: 100ml / Tonic: 50ml.